Kaleb Ballard was never supposed to be able to see ripples--cracks in time. Are Kaleb's powers expanding, or is something very wrong? Before Kaleb can find out, Jonathan Landers, the man who tried to murder his father, reappears. Why is he back, and what, or whom, does he want? In the wake of Landers's return, the Hourglass organization is offered an ultimatum by a mysterious man. Either they find Landers and the research he has stolen on people who might carry the time gene, or time will be altered--with devastating results for the people Kaleb loves most. Now Kaleb, Emerson, Michael, and the other Hourglass recruits have no choice but to use their extraordinary powers to find Landers. But where do they even start? And when? Even if they succeed, just finding him may not be enough. . . . 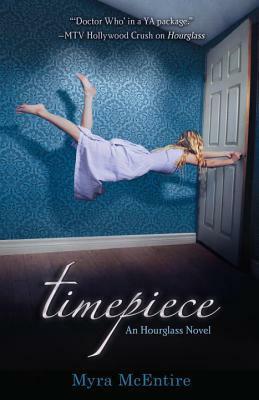 The follow-up to "Hourglass," "Timepiece" blends the paranormal, science-fiction, mystery, and suspense genres into a nonstop thrill ride where every second counts. Myra McEntire knows the words to every R&B hit of the last decade, but since she lives in Nashville, the country music capital of America, her lyrical talents go sadly unappreciated. She's chosen, instead, to channel her "mad word skills" into creating stories. She's an avid "Doctor Who" fan and will argue passionately about which incarnation is the best. You can visit her online at www.myramcentire.com.